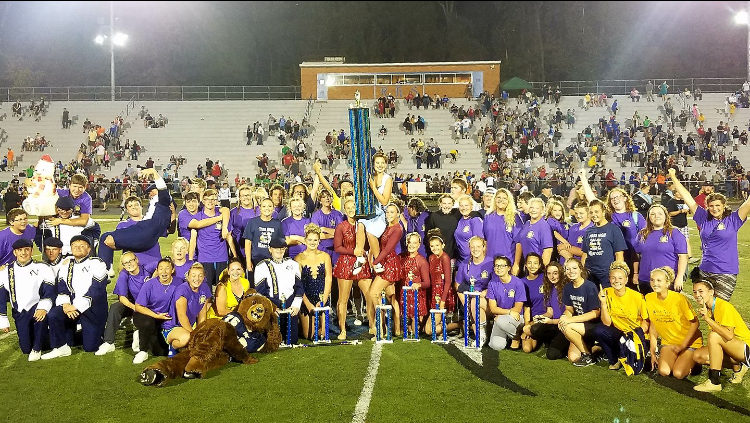 Because of their enthusiastic performance on October 7th, 2017, the NCHS Marching Grizzlies won the title of Division 2 Grand Champions at the band competition in Ripley, WV. In Division 2, they played their swing show like no other with the songs “It Don’t Mean a Thing (If It Ain’t Got That Swing),” “Caravan,” “Ja-Da,” and “Big Noise from Winnetka.” Everyone was so proud, but the Marching Grizzlies weren’t finished yet. The next weekend, on October 14th, 2017, they traveled to the Black Walnut Festival in Spencer, WV, for a judged parade and competition. They brought home 1st for the parade, and once again, they won the title of Division 2 Grand Champions! We cannot express how proud we are of our band and how proud we are of all the hard work that they have done. Congratulations to the Heart of Nicholas County!